Well, I slept on deck last night, the first time I’ve ever slept uncovered, under the open sky, off the cost of Skye in Loch Scavaig. It never really got dark and about 01:30 the sound of waves woke me up. When I had a look over the deck, we were at our closest swing at anchor towards the shore. Later on, there was a pretty sunrise and I was woken up by sudden wind on my face, as there was a gust from the steep hills. Seconds later the boat swung at anchor and the anchor position alarm went off, but all was well. It was magical (except for the occasional grunting seal). My finger was really painful through the night and when Michael helped me unbind it in the morning, I had to lie down again when the tight compression was released. 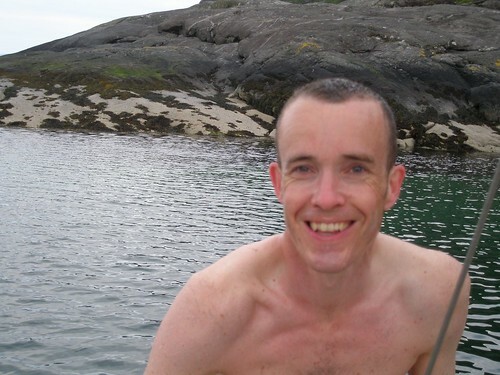 We tried to get the outboard onto the dinghy to go and see the seals on the rock in the middle of Loch Scavaig—we made great headway then realised that we were drifting with the wind and that the outboard had no drive whatsoever. We couldn’t figure out why, so Michael had to row us back to Freedom. We did see plenty if seals in the water, heard then grunting and saw them baskIng in different rocks. 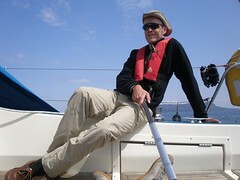 Left Loch Scavaig just before 12 and headed out in a nice blow to Canna. Soon passed a lively pod of porpoises that swam with the boat, one or two leaping out the water completely. They played close to the yacht which was exciting. Had a four hour sail, followed by about 45 mins of motor when the wind died. The sailing was mostly close hauled, making up to 6.6 knots. Despite the lack of wind we had blowy entrance when we reached Canna harbour. 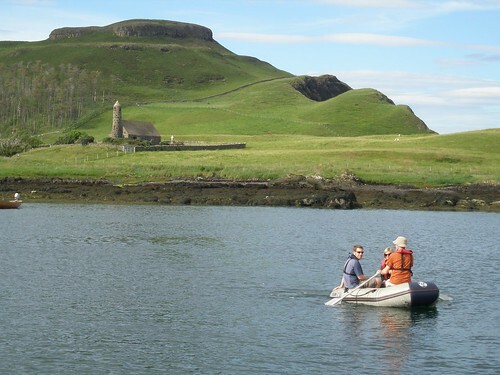 Only 20 people live on Canna, which in owned by the NT. 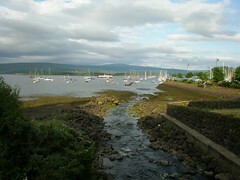 Great views and arrived in stunning shunshine. Michael, Nuala and Joel headed onshore on the dinghy to explore the church etc. I stayed on board Freedom on anchor watch. TVP chilli for dinner on a fantastic calm evening. The sea is so still it’s like a mirror (again!). Joel’s turn for a swim tonight. Calm morning when we left Tobermory at about 10. The showers in the marina were still blisteringly hot and it took some time to recover. 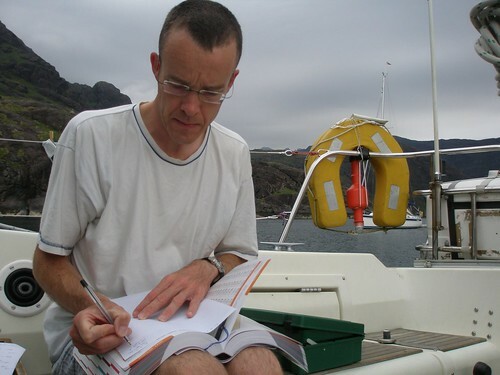 We had a long distance to cover to get to Skye and great sailing during the day making the 5–6 knots. Loads of big jellyfish in the water, there is a particular bloom at the moment. 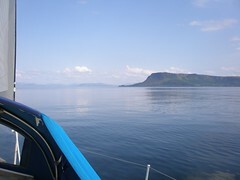 When we were approaching Skye the sea was dead calm, even in the middle of all the islands. 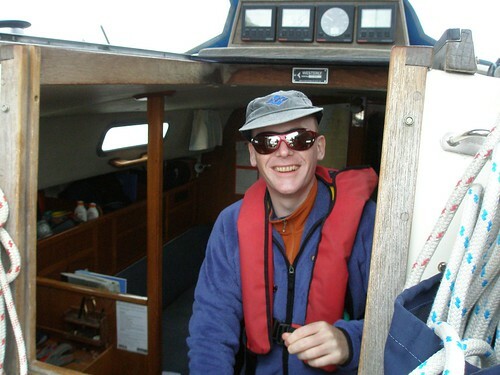 So with a wee way still to go and no wind, we put on the autohelm with the prospect of a few hours motoring. Had time to peel the tatties and neeps for dinner. 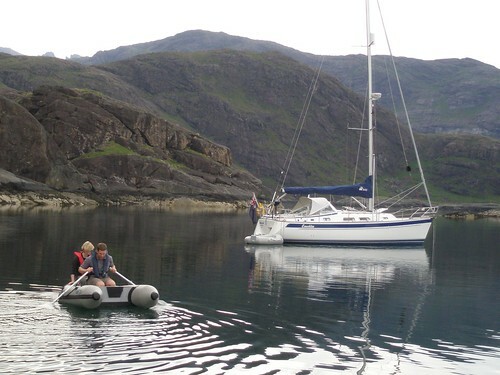 We were really looking forward to our anchorage at Loch Scavaig, and had to into the ‘overflow parking’ as the main part of loch. Saw some seals and only a few jellyfish, compared with the hordes that we saw earlier. 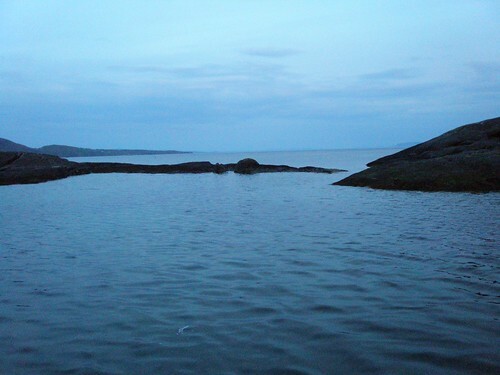 Michael and I grabbed a chance to have a swim, the water was lovely and cool after the day in the sun. 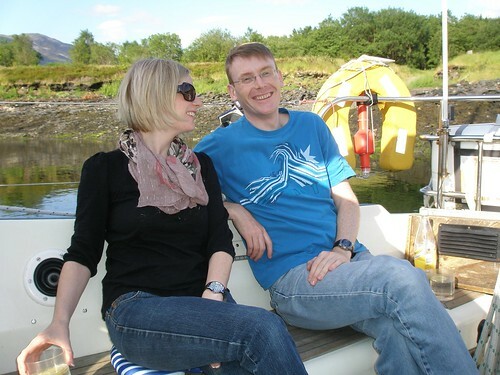 Nuala and Joel had a practice row in the dingy. Major mishap making dinner when the handle of the potato masher deformed and my thumb caught the edge of the saucepan and the rim of the saucepan went half way into my thumb under the nail. Had to lie down. Dinner was good though, accompanied by some Dalwhinnie. Played Uno H2O, getting the plastic cards off the table was the hardest part! Such a calm, hot evening that I’m planning on sleeping on deck, under the stars. Showers at the Isle of Glencoe hotel and bacon butties for breakfast, so a good start to the day (except I had to streak in the communal showers in the health centre). We motored out from Ballachulish, under the road bridge where there was still quit a few tidal eddies, and into Loch Linnhe. Lovely sail down the loch, on a beam reach, or a dead run. The weather was lovely, factor 40 suncreen required. 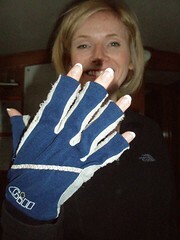 We wondered how long Nuala’s expensive nails would last on board (in fact they lasted the whole week—they were unshakable) but they didn’t stop her hauling at ropes and taking a turn on the tiller. 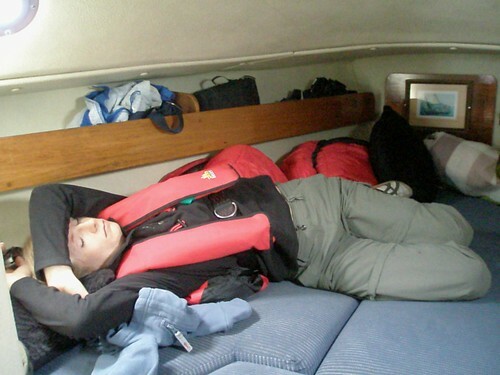 Nuala had just come of night shifts, so the fresh air knocked her out, and she founf a comfy space in the cabin for a snooze. 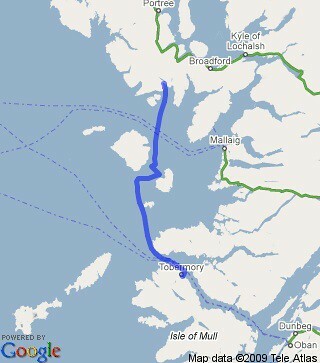 Had a lovely sail up the calm Sound of Mull, the wind followed us round the corner. Lunch on the go. We motored into Tobermory harbour about 4pm, and were immediately pounced on by the Harbour Master for the £20 mooring fee. This included access to the shower block, where we could have a scalding hot shower for £2, and we did. 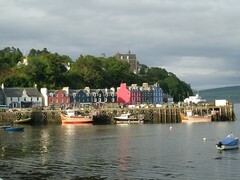 But that was after drinks at the Mishnish Hotel across the harbour from the mooring. 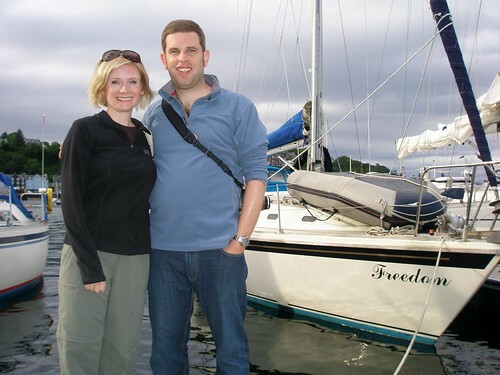 We ate back on the boat—some of Joel’s premade and frozen vegetable chilli, which was great. Washed down with wine (and then whisky!). First stop on our way up north was Majestic Wine, to stock up on wine and spirits—bought a case of nice wine, and picked by Michael!, and a bottle of whisky and Blackwood Gin from Shetland. Clinking on our way, Joel drove us to Ballachlish, via Callander, to pick up our yacht from Lochaber Watersports. 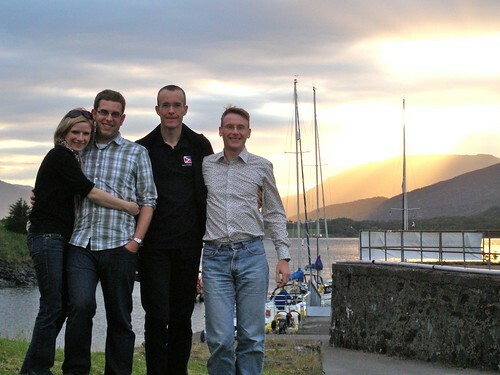 While Nuala and Michael checked the boat over, Joel and I made a shopping run to Fort William for food for the week. We bought an immense amount of food (it felt) and thought there would be enough to feed six. The food all disappeared into various lockers on board no problem, and so had the time really, because we barely had time for a gin of deck in the lovely sunshine before it was time for dinner. We had a meal at the Isles of Glencoe Hotel, which is a nice hotel but pretty expensive. The menu was interesting, the food was fine—the champagne helped! 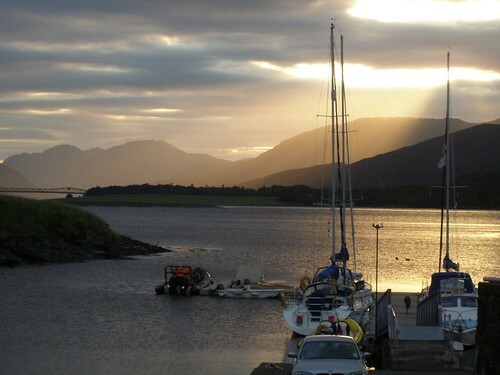 There was a glorious sunset when we emerged after dinner, and just enough time to admire it before we had a nightcap at the Laroch Bar, in the town. I had a pint of Younger’s Tartan Special, because I haven’t seen it for years. It’s still not very special! 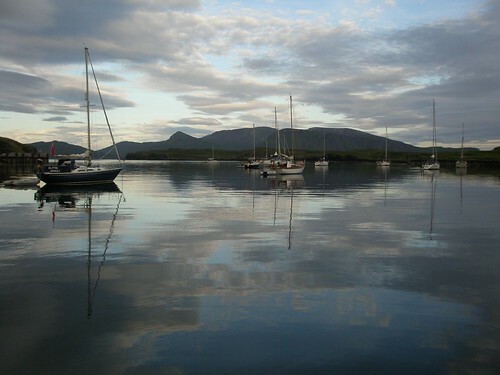 The tides had stopped us leaving Loch Leven today (we’d have to have had a first sail as a night sail!) and so we’ll be off tomorrow morning. 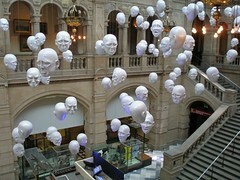 Arrived off the sleeper into Central Station in Glasgow—what a great way to travel! Bit of breakfast and Dad swooped down, illegally parked and picked us up from outside the station. That only worked because it was 8am! Had breakfast with Mum, Dad and David at their house and there was quite a bit of chatting and catching up to do! 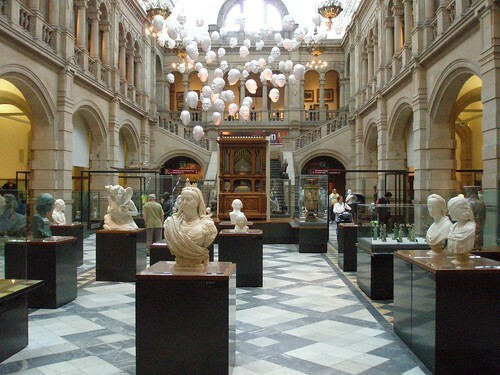 We headed over to the Kelvingrove Museum and Art Gallery. I haven’t been there for years, and the building has had a recent make-over so looked superb, with the dark red sandstone all cleaned. We had a wander around Kelvingrove Park and mum told us about her growing up very close to the park when she was a young girl, and it was the park she played in. Inside the Art Gallery and Museum there is a broad mix of art, museum collections, local material and a disconcerting, noisy Dr Who exhibition. The exhibition had brought some hordes of children (not too bad on a Friday though) and our lovely tea and cake was accompanied by exciting dalek noises from the crammed table next to us. I liked the sculpture exhibition of busts in one of the main wings: very impressive and there were some photographs of the museum when it was originally built that showed a similar concept of a spacious sculpture gallery. 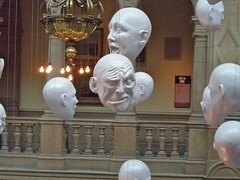 I really liked the installation of Faces, Expressions, which was captivating. I can’t find out who the artist is though! Mum and Dad drove us over to Nuala and Joel’s in the evening. Joel was in mid-packing for sailing and Nuala was working till 9. Travelling by train is much more relaxing than flying. We had dinner in a nice vege Indian Restaurant in Euston last night, then a beer at the Bree Louise while we waiting for the train to to be available. At 11 jumped onto the train after being welcomed by the nice steward, who was all fired up by the breaking news of Michael Jackson’s death. Enjoyed a Tomatin whisky in the lounge car, Michael had a Glenfarclas, in a nice but warm and very slow atmosphere. Good night sleep, getting woken now and again by the train shunting. Lying in bed now looking out the window, siping tea and eating shortbread (breakfast could be better, an extra £4, but it’s a bit early). On Friday night, Michael and I went to see Sweeney Todd, a musical by by Stephen Sondheim (made into a great film with Johnny Depp). The Festival Players did a great job of the production, and it was a long performance at almost three hours. Cat Nicol was really good as Mrs Lovett—that’s a nice part, but she really excelled in this. Warren Clark was good in bursts, but looked a bit shattered and didn’t smile at the end, so he might have been having a bit of an off day—he had a great presence and a good voice, but overall I suspect he fell short of what he can deliver on Friday. The chorus was great! Michael had a Bloody Barber (I think) cocktail, which was like a bloody mary, but with the addition of campari! At the interval there were pieces of pork pie on the bar—gruesome! Thrilling, operatic and full of drama, this spectacular musical tells an absorbing and stylish tale of love, murder and obsession. Sondheim’s lyrics are typically sharp, tender and hilarious – and the music spell-binding. Set in the harsh underworld of Victorian London, the show is both poignant and darkly comic whilst featuring some remarkably close shaves and surprisingly delicious pies! Recently adapted in the film version starring Johnny Depp, the original stage show is justifiably hailed as a theatrical masterpiece which won numerous accolades including eight Tony Awards and Best Musical. Presented by Cambridge’s own Festival Players, the originality and quality of the production are assured as they return to the ADC for the first time since their hugely successful production of The Witches of Eastwick. A truly memorable evening of theatre, music and culinary resourcefulness – not to be missed!